Perfect for a party our truly British cheesecake makes a great centre piece - and takes no time to make! 1. Tip the crumbs into a bowl, add the baking spread and mix in. Spoon the crumbs into the tin and press down. Chill for 10 minutes. 2. Pour the condensed milk into a large bowl. Add the light cheese and whisk together. Mix in the lemon juice (watch it thicken!). Pour into the tin. Chill for 2-4 hours or until set. 3. To serve, take the cheesecake out of the tin and place onto a plate. 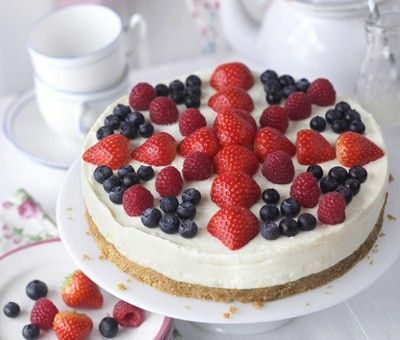 Decorate the cheesecake with the berries in the style of a Union Jack before serving.